Northern Spark is known as an all-night art festival that lights up the Twin Cities. This year, we’re trying something new. In mid June, tens of thousands of people gather throughout the city to explore giant video projections, play in temporary installations in the streets, and enjoy experimental performances in green spaces. Late into the night the city surprises you: friendly crowds, glowing groups of cyclists, an unexpected path through the urban landscape, the magic of early morning after a night of amazing art and experiences. In 2018 we are experimenting with a new model: a two-night festival that runs from sunset to 2am each night. This shift is both experimental and practical. After the historic rains on festival night in 2014 and several subsequent years of barely dodging thunderstorms, the two-night model creates a built-in rain date. 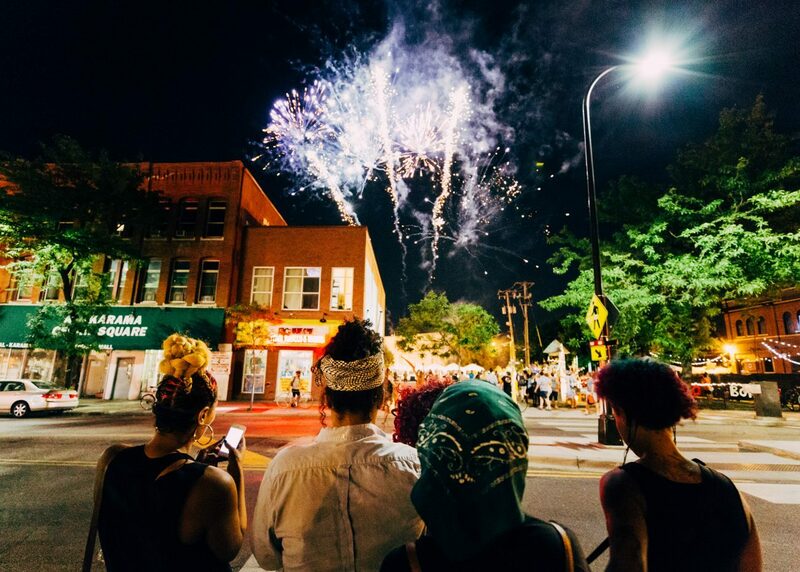 Two nights also gives more opportunity for audiences to fully experience the magic and connection of Northern Spark. Northern Lights.mn is grateful for the generous involvement of these organizations in the support and programming of Northern Spark 2018: Hennepin County Library, Minneapolis Downtown Improvement District (DiD), Green Minneapolis and The Commons, The Arts, Culture and the Creative Economy program of the City of Minneapolis, African Economic Development Solutions, and Native American Community Development Initiatives. In 2017, Northern Lights.mn introduced a Program Council as part of the festival planning process. The council of artists championed the cultural neighborhoods where Northern Spark 2017 took place by engaging, planning, and curating artist projects for the festival. With our commitment to increasing the demographic representation of artists, in 2018 we are convening the next Program Council who will work beside us to plan Northern Spark 2019. Stay tuned for the introduction of the new Program Council.